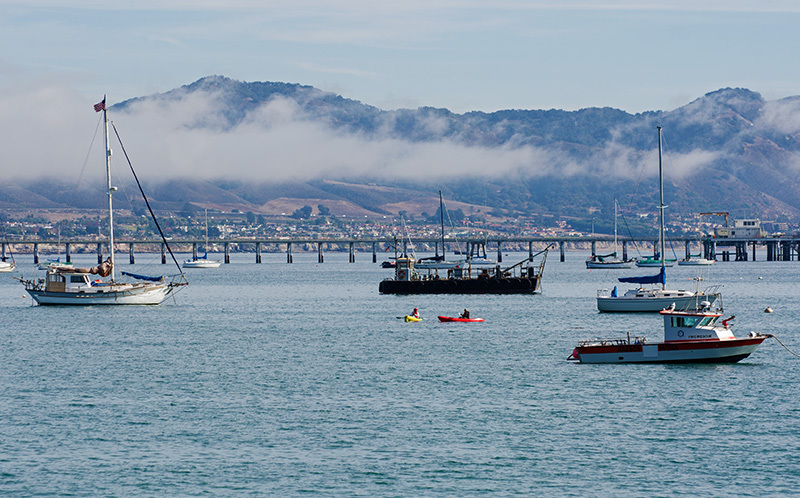 Last year we did a story entitled “Five and a Half Days” in which we visited San Francisco, Sausalito, Napa, Fairfield, Suisun Bay, Benicia, The Delta, plus visited the Jelly Belly Factory, fished Grizzly Island, and so much more yet only in five and a half days. We never felt rushed and spent hours just leisurely kicking back or fishing along the rain saturated banks of the delta. This time we are doing a mini version called, Three and a Half Days. On this trip, we visited Cayucos, Avila Beach, Pismo Beach, Grover Beach, Oceano, Summerland, The Dutch town of Solvang, Carpenteria, Downtown Ventura, and Santa Barbara. We visited a butterfly grove, an ostrich farm, we saw six piers plus drove on two, we fished at night under a full moon, we saw otter and seals, and made it back home in time to watch the 6:00 news. As with the other trip, we never felt rushed. Don’t ask me why but we decided to make our first stop and overnight stay at Cayucos, a small town situated on the central coast of California. Maybe it was because every hotel on this New Year’s weekend was pretty much booked except for the really expensive rooms. Luckily, we found an inexpensive vacancy in Cayucos, so I immediately perused the internet to find information about this hotel. The reviews were all over the place. One person loved their room, the other hated it, some thought it dirty, and others thought it was fine. So it was with much trepidation that I pressed the “Book It” button on the online travel site. 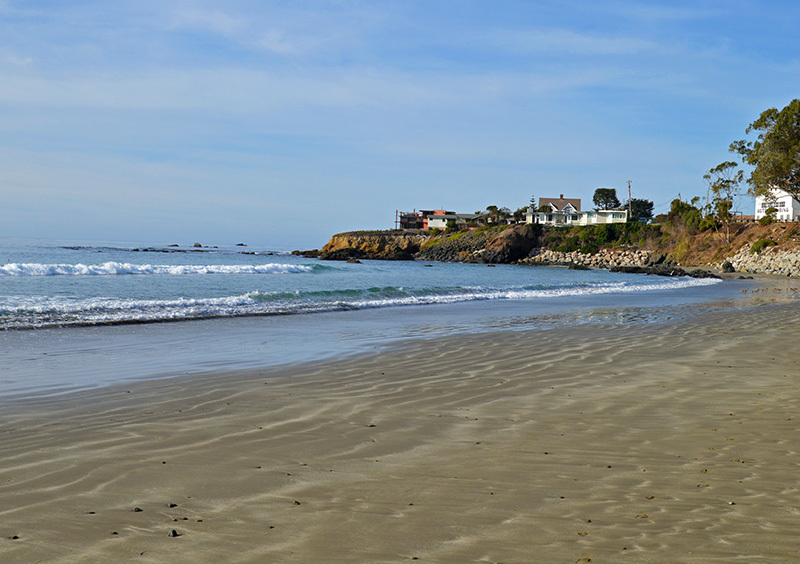 We arrived in Cayucos and checked into the room. I became just as undecided as the reviews, I both hated it and loved it at the same time. It had a small living room, with a kitchen, separate bedroom, a couch, chair, and a fire place. That is what I loved about it, plus it was on the main street and close to the beach. We won’t go into what about it I hated. It was dark now and our bodies were stiff from a long drive, however, we were still running on adrenaline, so we decided to check out the vicinity nearby…it didn’t take long. There appeared to be one main street with restaurants, shops, and various other businesses. It was just past nine thirty and it seemed like the town had already rolled up the carpets. 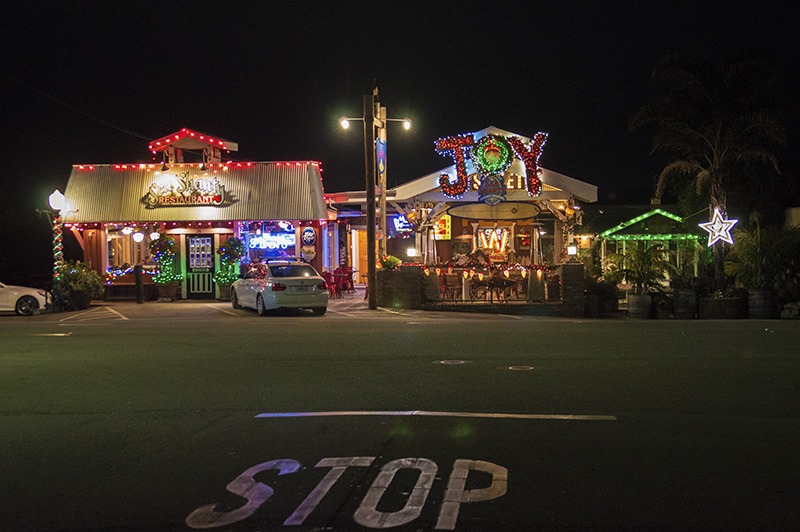 On this road, the Sea Shanty restaurant was all decked out in holiday lights and looked to be the happening place. A few other eateries and bars had their fill of patrons but other than that, the road was quiet. Most of the homes lined the rolling hills of which is quite common on the central coast. After a long dry summer, the hills were more of a brownish tint than their normal vibrant green. We drove by the pier and on a side street nearby there was a pizza joint and other local businesses. Not to overuse a word but it was quaint as they come. 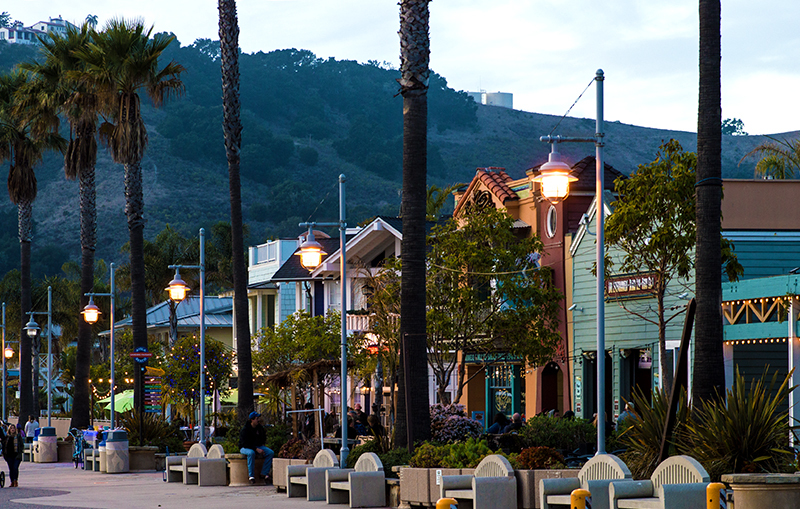 It is the quintessential small California beach town. In the morning, we drove around again and set our first sights on the waterfront. 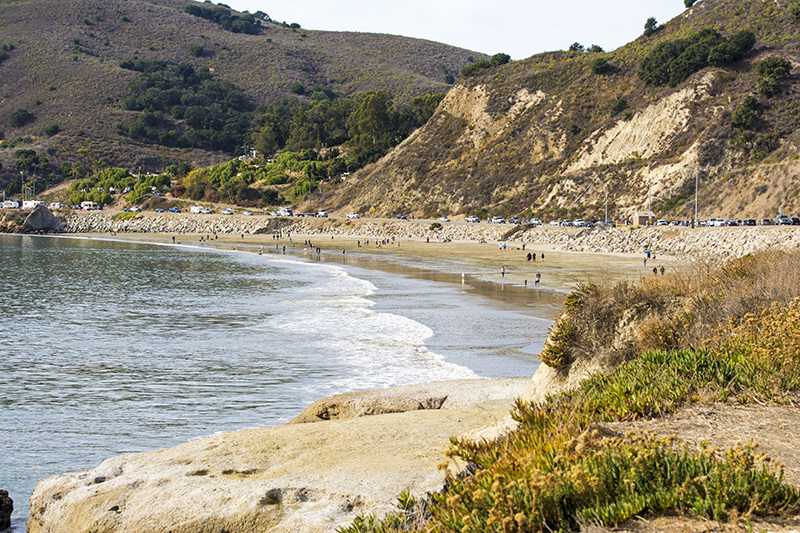 At the north end of town sits the small Estero Bay where you can hike along the bluffs while getting an amazing view up and down the rugged coast. 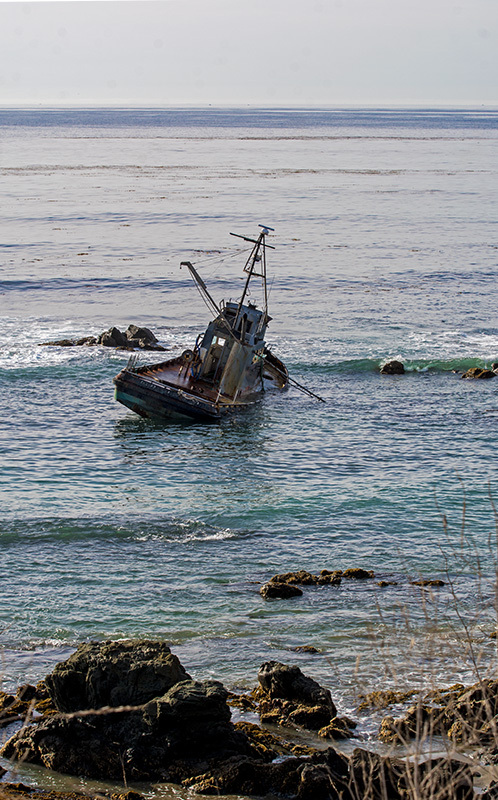 There was a small fishing boat shipwrecked on the rocks and my imagination ran wild on how it got there. Was it fog, a storm, broken down motor, or too many Tequila shots? Whatever it was, I am sure it wasn’t a good day for that boat owner. In the distance you could see the large imposing rock that marks its home in Morro Bay. On this hazy gray morning you couldn’t tell where the water ended and the sky began, but the majestic Pacific Ocean was still beautiful. 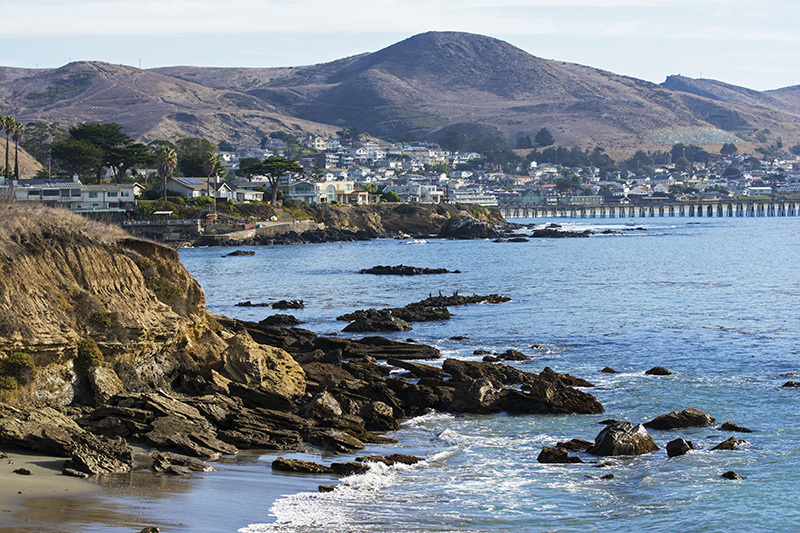 The central California coastline has more rock formations offshore than its Southern California counterpart, making it very picturesque. The Cayucos pier was closed off which I believe was due to winter repairs, so a walk on the beach to search for sea glass was the order of the day. To the touch, the sand felt really fine and there weren’t many rocks, too bad because a congregation of pebbles is a good place to find sea glass. I found a few larger pieces but they could have stood to stay in the water a little longer to develop smoother edges. I grabbed them anyway. 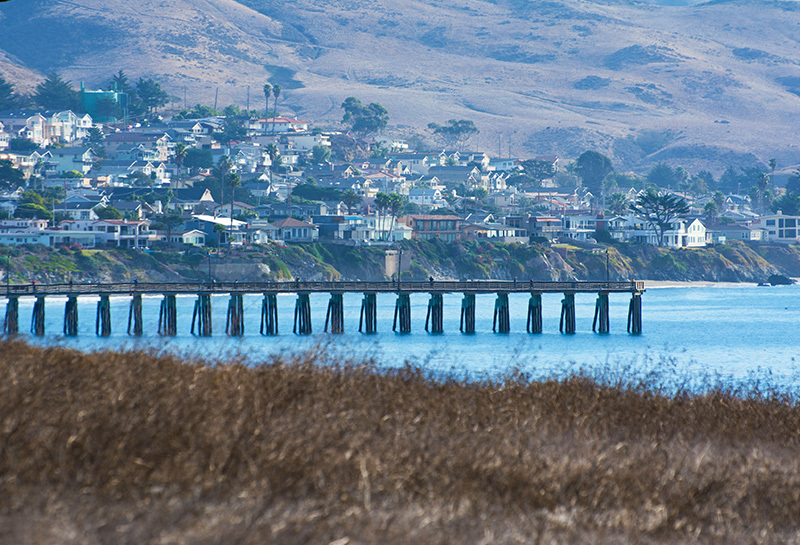 Cayucos with its population of just over 2,500 is a charming town, mellow as it gets, a place you go to enjoy the ocean, the scenery, to relax, and chill. It is just about 6 miles above Morro Bay on the central California Coast. I really loved this place but it was now time to visit Avila Beach. 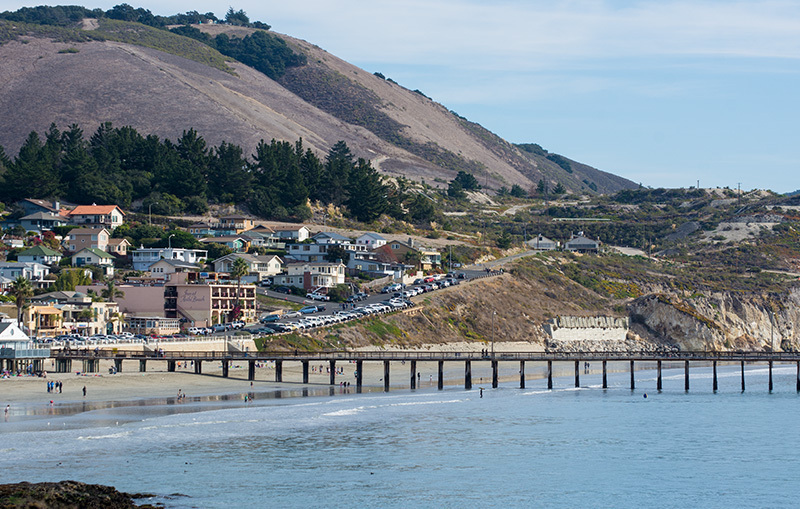 With a larger population of just over 15,000, Avila Beach is 23 miles south of Morro Bay. 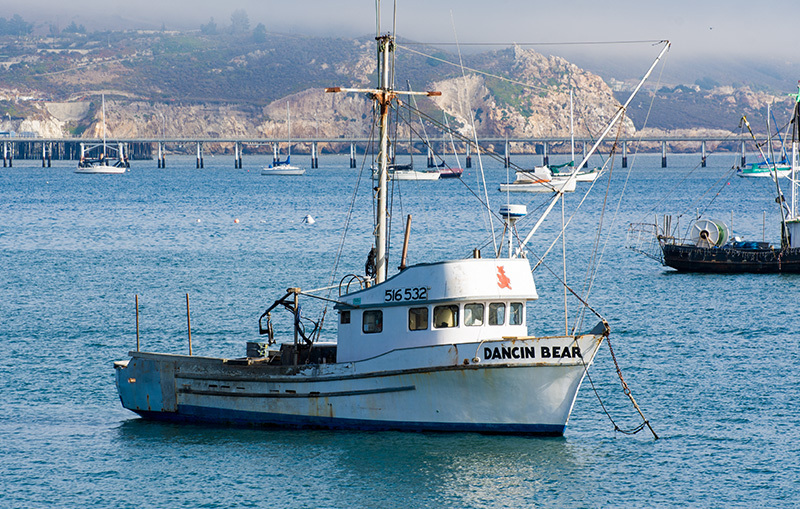 We decided to bypass Morro Bay so we could spend more time in places we have never been before. I will definitely be coming back. We loved, loved, loved it there. As you come into town off of the 101 Freeway, you don’t know which way to turn first, towards town, the marina, or towards the piers, we headed towards the piers. Yes, piers, three of them in fact. The longest one is private and was donated to Cal Poly for coastal marine sciences. The other is a lot shorter and available for public use although as was the case in Cayucos, it was closed down. 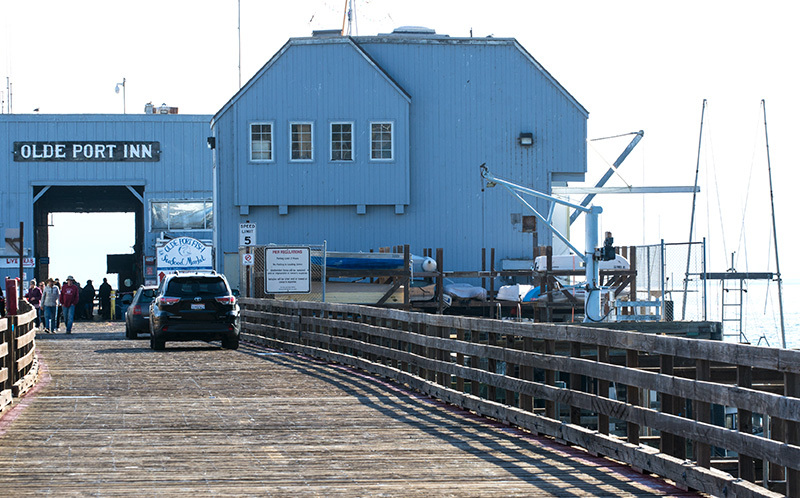 Far on the north side sits the third and amazing Hartford Pier at Port San Luis. It is one of few piers that allows you to drive a car on it and park. As your auto enters the structure, the clippety clop sounds of your tires on the wooden planks remind you where you are and that you are driving just a few feet above water. More of a wharf style structure, on top sits a few restaurants and shops. 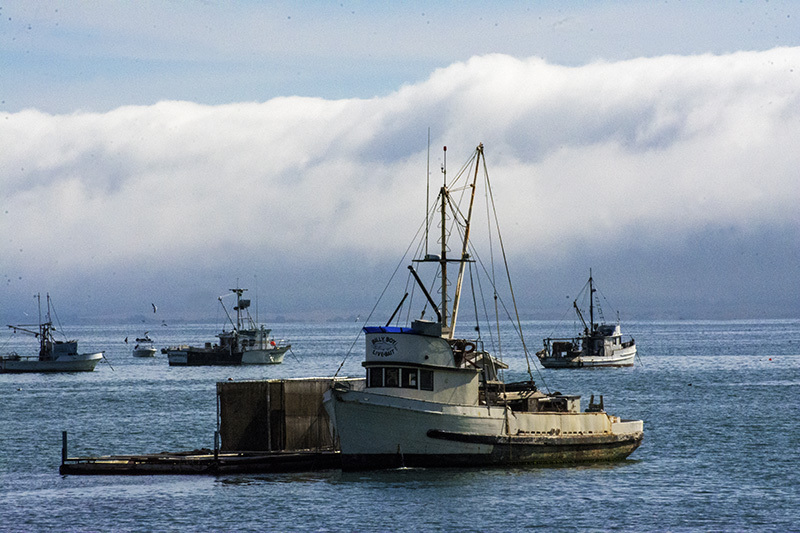 At the very end you can fish and watch the commercial fishing boats as they enter the harbor while on their way to offload their catches. Some of their bounty goes straight to a fish market which is open to the public. Ironically, we listened to a book-on-tape on our drive up which was a story about a fisherman and a village on the Maine coast. This looked like the same place! Just like the story, there were buoyed fishing boats bobbing up and down slowly while on the calmer waters of the port. Off shore there were interesting rock formations and Avila actually did have a beach. Besides the main beach, there we a few sandy areas that could only be accessed by kayaks or SUPS’s and there were plenty of both in the water on this sunny day at the end December. However, that sunny day would soon be changing. Looking out to sea, a gigantic wave of gray clouds were rolling in towards land. Although it was a just a normal coastal eddy common in these parts, it looked like one of those huge tsunamis you see in movies. It never did engulf us completely but it did cause a few low clouds to squander in and block the sun for awhile. We left town for a few hours to visit Pismo Beach but just had to come back because we loved it so much. So after Pismo, and as the sun made its final goodbye, we headed in to the main city to explore this vicinity before we departed for the day. 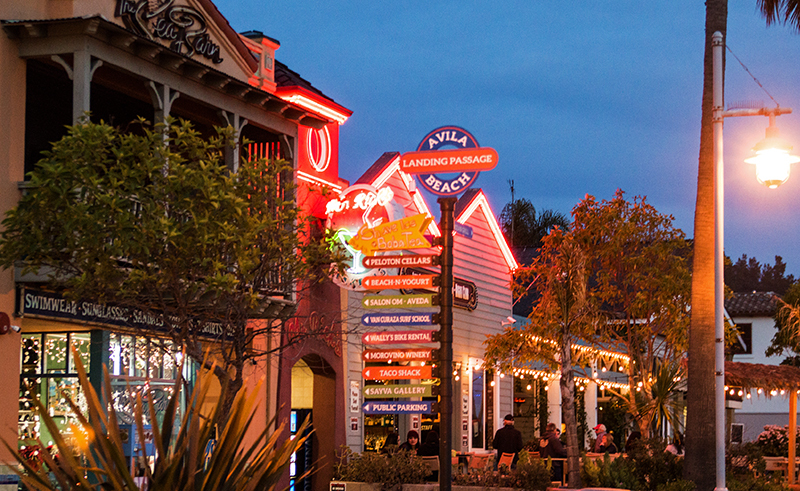 With the twilight sky still a vibrant light blue, we checked out the establishments along the boardwalk. The promenade area had unique stores, charming coffee shops, wine tasting rooms, plus there were sweets, gifts, and souvenirs. A few of the restaurants had outside patios with unimpeded views of the Ocean. Outdoor lights and lanterns added to the ambience making it even more appealing. It is a great place, I could stay for the weekend or even a week here, no problem. I didn’t want to leave, so we decided that it was too nice of an evening and drove over to the wharf again to fish for awhile. We found a parking spot only about twenty feet from where we were able to throw out our lines. I love walking on a pier but it was a unique experience to drive right up close to where we would be setting up our chairs. The air was crisp and the sky was getting darker. The nearly full moon shone brightly against the lights from town and you could easily see the coastline far beyond from this vantage point..it was a magical setting. A few of the sea food restaurants still had customers enjoying what I am sure was great food, but the shops were just closing down. Surprisingly only a few people were fishing from the pier. Did the locals know something we didn’t? This was probably so, as we didn’t catch a thing. A lone fishing boat made its way in from what was probably a long day out at sea. They offloaded their gear and daily catch onto the pier. Then the boat glided over to its buoy to tie down and finish for the evening. It was just like the scene described in the audio book, only this was California!!! Avila Beach will get a return visit from me, I can promise you that. Now if I can just remember how it is pronounced. It is actually, “Ave-A-La” not A-Vee-La. I wish I had a dime for each time I said it wrong. Regardless, it is well worth a visit. 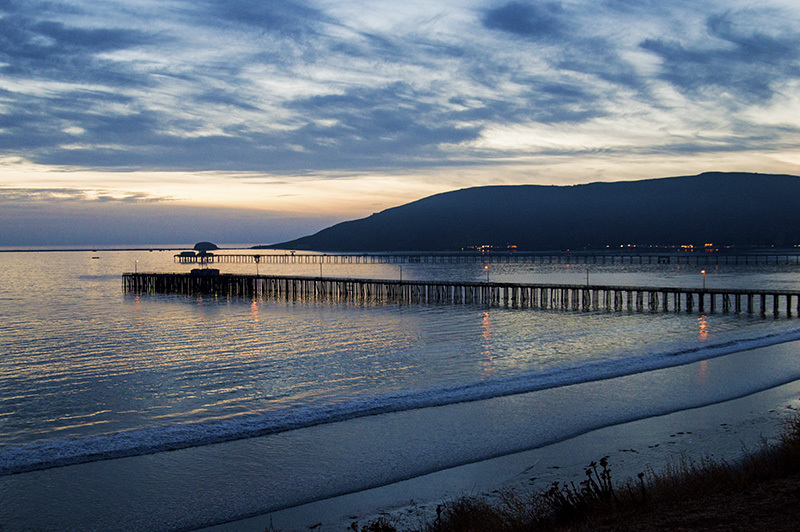 Stay tuned for Part 2 of Three and a Half Days as we visit Pismo Beach, Grover Beach, and Oceano.